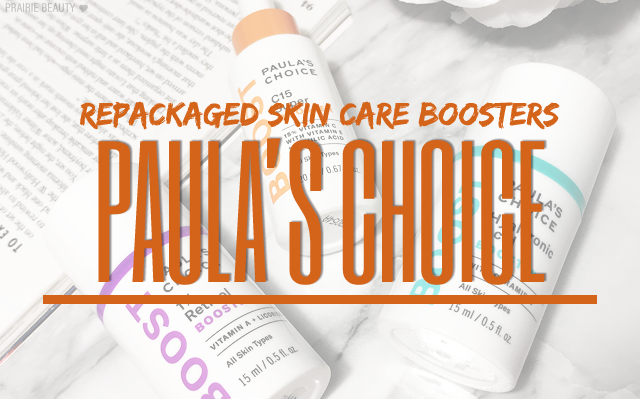 Paula's Choice is a skin care brand that I've loved for years now and one that I've always been able to count on to give me the results that they promise in formulations that are backed by science. For me, that's probably the most important thing about skin care. Recently, after they did a rebranding of their booster line in modern, colorful packaging, I've been trying out a couple of PC's boosters and revisiting one that I've loved in the past, so I wanted to share them with you guys. 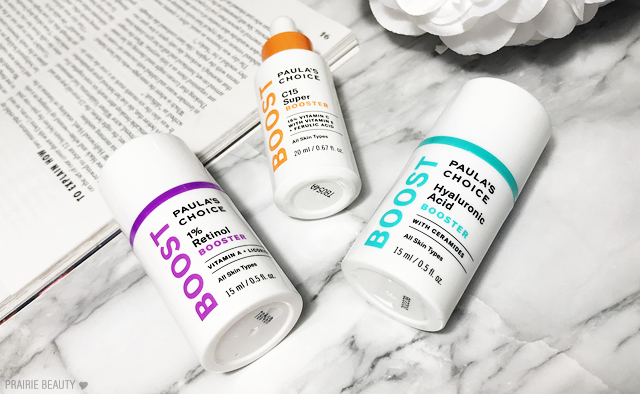 For more on Boosters and why they're a great addition to your skin care routine as well as my thoughts on these three that I've been using, keep reading! So what is a booster? In order to get the most accurate answer that I could to this question, I'm leaning directly on the Paula's Choice website. According to PC, "A booster is a targeted skincare product that focuses on the unique capabilities of a particular ingredient that's used at a higher concentration. Boosters target specific skin concerns like enlarged pores, dehydration, dullness, loss of firmness, and so on. They work with your other skincare products, allowing you to customize your routine so you can quickly achieve the exact results you want." Makes sense, right? If you're using products with active ingredients intended to target specific skin care concerns along with your regular skin care, you're likely to see real results. 1% stabilized pure retinol and a network of proven antioxidants create an anti-aging superstar booster for all skin types. This water-based, weightless fluid glides on easily and absorbs quickly. It dramatically improves multiple concerns and is highly recommended for both signs of aging (especially wrinkles) and it's even suitable for blemish-prone skin. Retinol has become a bit of a must for me and, though I don't use it as consistently as some other active ingredients, it's definitely the ingredient that has given me the most significant results. Because I do use a light hand and my skin has gotten used to having retinoids applied, I definitely look for something that's not going to have any of that peeling or sensitivity that can be associated with retinoids, so I'm always paying close attention to that, and I want to see results though I'm not looking for anything overwhelmingly dramatic. For me, the Paula's Choice 1% Retinol Booster* is definitely a winner. It's a fairly thin gel consistency, sort of orange in colour, and has that slightly sour scent that I've noticed in other retinoid products that I've used. I use 2 pumps to cover my entire face and neck and would definitely say that's plenty for me to get the results that I'm looking for. You can also mix this in with your moisturizer or serum for ease of use, but I personally prefer to apply it alone to my skin. It sinks in quickly, though it is a little bit tacky and I definitely recommend following with moisturizer that suits your skin. With consistent use (used at night every 2-3 days) this has definitely given me exactly the results that I expected. My skin looks and feels just... fresher and smoother. I'm in the earlier signs of aging stage of my skin and this is a perfect product for me to keep my skin looking fresh, young, and free of significant breakouts. I definitely recommend this. Moisture-boosting hyaluronic acid holds 1,000 times its weight in water, and combines with restoring ingredients to visibly plump dry, dehydrated skin, softening the appearance of fine lines and wrinkles. This booster's oil-free gel texture glides on to immediately replenish moisture and soothe skin. Hyaluronic Acid is another skin care ingredient that I personally see a ton of benefit from and that I think is really suitable for all skin types. I know that the word acid can seem really scary if you're not familiar with them in skin care, but unlike the exfoliating AHAs and BHAs, hyaluronic acid is a hydrating acid that attracts water to itself and helps to maintain that moisture so that skin not only feels more hydrated but looks more plump and healthy. 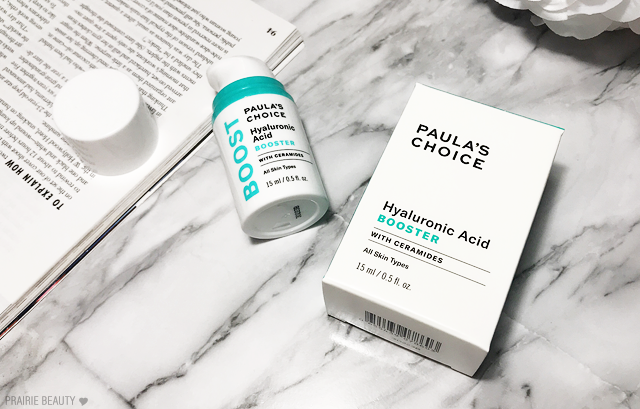 Overall, I really enjoy the Paula's Choice Hyaluronic Acid Booster*. Again, you can use this alone or mixed in with a moisturizer or serum, but I prefer to use it alone as the last step in my skin care routine before I apply my moisturizer. I also prefer to use this during the day, since it helps to boost hydration without having to add a heavy moisturizer. This product has a light gel texture that spreads really easily over the skin and sinks in quickly without any stickiness. I actually find that this gives my skin an instant boost in both the feel and look of hydration. I actually applied this to the back of my hand to test the visible results and within about 30 seconds, the hand I had applied it to looked smoother and more hydrated. While I personally wouldn't say that this performs wildly better than other, similar products that I've used, it's definitely a solid Hyaluronic Acid product and I do recommend it. 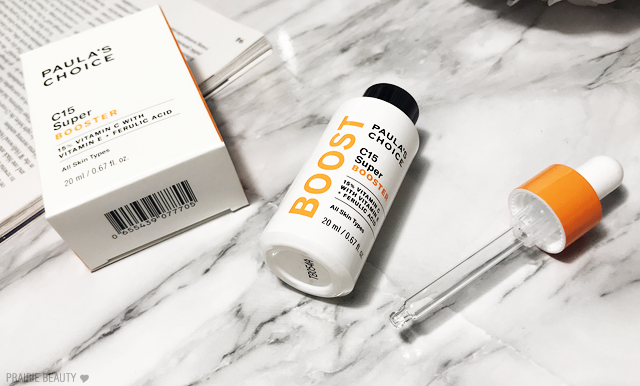 Our potent 15% vitamin C booster effectively combats several visible signs of aging. It increases radiance, visibly firms, evens out skin tone—and can also be used around the eyes to address crow’s-feet. Ahhhh Vitamin C - another staple in my skin care routine that I don't think I can live without these days. Vitamin C is a strong antioxidant that helps to both repair and protect skin from environmental damage. For me, the reason that Vitamin C has become so important to my skin care routine is because it helps to even my skin tone, brighten dullness that I struggle with in my fair skin, and increase the efficacy of my sun protection products as well as helping to repair exisitng sun damage. This is actually the only product of these three that I had tried before - and finished! - and I'm really, really in love with it. You can read my original review here. I'm not the hugest fan of the packaging, since Vitamin C is an ingredient that degrades quickly and I'd prefer to see it in an airless pump, but I'm sure that since Paula herself agrees with me about that there has to be a formula specific reason that this comes in a dropper bottle. Packaging aside, though, this stuff works. Period. Like with the other two boosters in this post, you can use this alone or add it to a moisturizer or serum - and I of course like to use it alone and as a part of my morning routine to amp up my SPF. This is a fairly gentle formula and the tingle is minimal for me, no irritation or sting. It sinks into the skin well and is lightweight enough that I've never had a problem layering it under makeup. But most importantly, it really does work. In fact, of all three of these products this would be the one I would most recommend. It's solid and it works. Overall, I'm really happy with all three of these products. 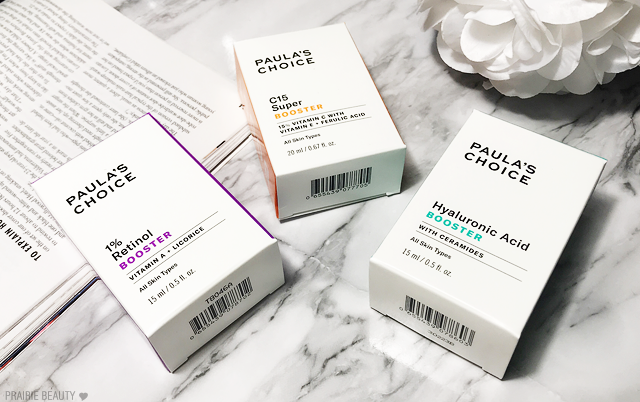 I'm not really surprised, since efficacy has never been an issue for me when it comes to Paula's Choice products and I know that they're backed by evidence and formulated at strengths that work. 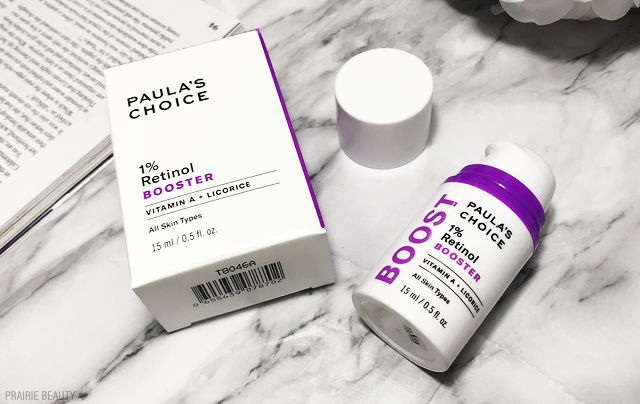 I'm actually really interested to try out some more of the Paula's Choice Boosters - especially the new Peptide Booster that I'm absolutely certain my skin is going to fall in love with. Paula's Choice products are available on their website and if you're interested in more of my Paula's Choice product reviews, you can check them out here.